Bearings support the rotor in industrial rotating machinery, transferring loads from the rotating components to the stationary casing. Thrust bearings accommodate the axial loads, and journal bearings accommodate the radial loads. Hydrodynamic bearings are commonly used in large turbines, generators, compressors, gearboxes and pumps in the power generation and oil, gas and chemical processing industries. Hydrodynamic bearings work by floating the rotating components on a thin film of fluid and are often referred to as fluid film bearings (see Image 1). The separation of the rotating and stationary surfaces results in very low friction and negligible wear, giving the hydrodynamic bearing an exceptionally long life—in many cases equivalent to the life of the machine. Pumps typically use hydrodynamic bearings when operating conditions exceed speed or life limitations of rolling element bearing designs. 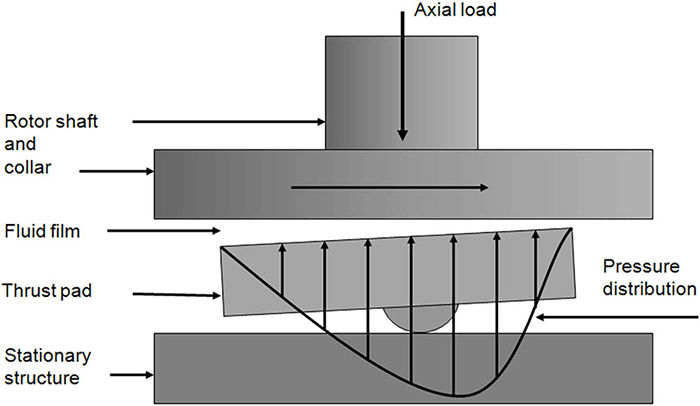 The most basic type of hydrodynamic journal bearing is simply a cylindrical bushing with two axial grooves to channel fluid to the bearing surface. Image 2. Hydrodynamic journal bearing types. The speed column is measured in meters per second. The cylindrical journal bearing is suitable for a wide range of operating conditions but is eventually limited by speed due to a vibrational instability called whip. Variations in the bore profile improve the speed capability, measured in meters per second (m/s) in Image 2, giving rise to various types of fixed geometry journal bearings referred to as elliptical, offset and lobed. The tilt-pad journal bearing is not a fixed geometry bearing but rather is composed of individual pads that are free to tilt. The tilting pads allow stable operation to very high speeds. There are three basic types of hydrodynamic thrust bearings used in industrial rotating machinery. The flat-land bearing is the simplest design, formed from a washer-shaped plate with radial grooves to channel fluid to the bearing surface (see Image 3). The flat-land thrust bearing has very little load capacity and is mostly used as a bumper for momentary load reversal. The tapered-land bearing is similar in design except that slight tapers are machined on the lands, which provide substantial load carrying capability (see Image 4). 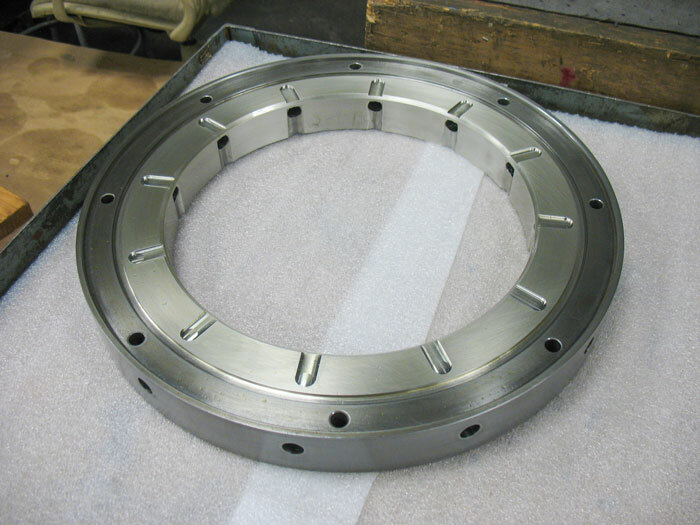 Hydrodynamic thrust bearings that incorporate individual segments with pivots (see Image 5) are referred to as a pivoted shoe, tilt-pad or pivoted pad thrust bearing. 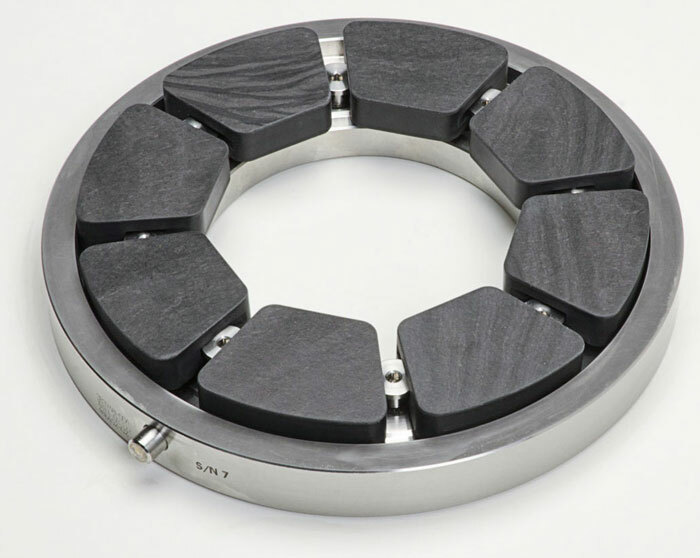 The pivoted shoe thrust bearing is capable of adjusting to changes in operating conditions and has the highest load capacity of the three. 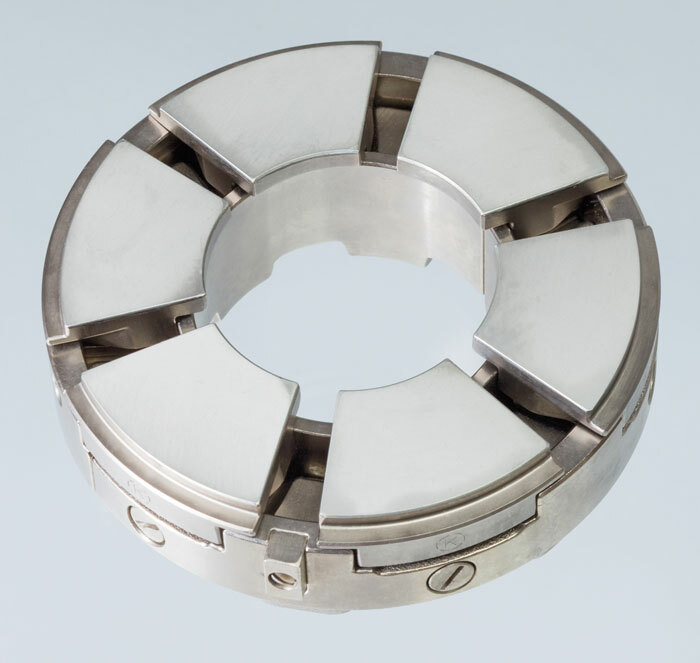 A variation of the pivoted shoe thrust bearing is the composite shoe thrust bearing (see Image 6). The hydrodynamic film forms with shaft rotation, so an appropriate fluid must always be present during operation to keep the bearing and rotor surfaces separated. If the fluid flow is lost or interrupted during operation, the bearing surface will come in contact with the shaft and be damaged. The fluid used in most hydrodynamic bearing applications is a mineral oil or synthetic lubricant. The bearing components are typically steel with a layer of a soft tin alloy called Babbitt, bonded to the bearing surface, which helps protect the shaft from damage. In vertical applications, the bearings are submerged in a pot of lubricant with cooling coils to remove the heat generated by shear of the lubricant in the oil films. For low speed horizontal machines, the lubricant may be supplied by rings or discs that spin with the shaft, dip into a sump and distribute lubricant through passages to the bearings. A tremendous amount of heat is generated by the films in higher speed units and external lubrication systems are required to provide sufficient flow and cooling capacity. Pump applications allow two unique options compared to other rotating machines. The relatively low speed makes it possible to use a self-contained bearing system in some applications instead of a more expensive external lubrication system. One dual bearing thrust/journal system, for example, consists of flange mounted casings that contain pivoted shoe thrusts and cylindrical journal bearings, a sump, a heat exchanger and an oil circulator. This option is ideal for remote locations where electricity or cooling media are limited. Another option in some applications is to design the pump to use the process fluid as the bearing lubricating media using suitable hydrodynamic bearings. 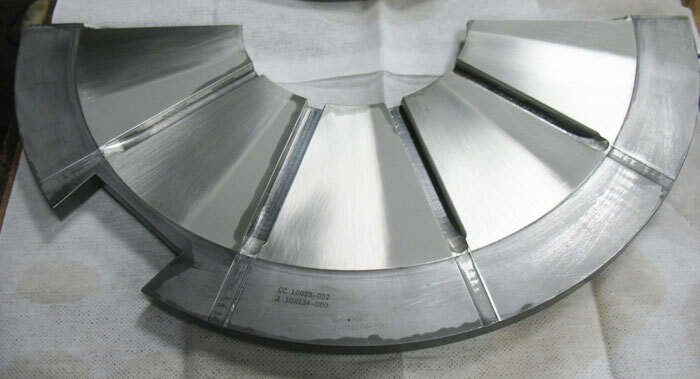 Image 5, for example, is a hydrodynamic pivoted shoe thrust bearing with polytetrafluoroethylene (PTFE) composite pads used for diesel fuel processing applications.